First of all I want to explain the definition of espresso: fast! The creation of espresso was a result of cafes being unable to cope with the demand for coffee in the 15-1900s. The mastery of steam power combined with the ever increasing strength of steel (original espresso machines often exploded due to weakness in the metal) meant that in the early 1950s and 1960s espresso was born. Now for assumptions: I assume that you wont be making huge volumes of coffee. If you are a home barista then even if you have 5 people over for dinner a single group should do. You are looking at around $1000 for a basic package that can help you compete with the quality found in most top 200 cafes in Melbourne. I believe there is a growing population of espressionists (definition: those coffee geeks who are particularly crazy about espresso) who are mastering the art of espresso at home (see earlier post on #quality). #1. 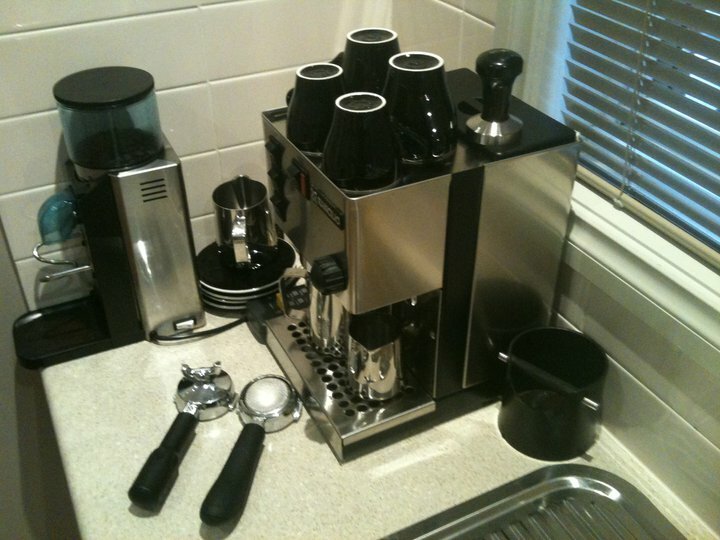 Brass boiler (heavy parts) – some espresso machines have aluminium parts and this creates a huge problem with espresso. No matter what your coffee philosophy is (hot, cold, warm etc.) you wont get the most out of your bean without an extraction at around 90 degrees. The reality of an aluminium boiler coupled with small, light, aluminium portafilter (also known as group handle) is at worst burnt, bitter coffee or at best inconsistent, unreliable results. Aim for a brass boiler, heavy brass parts, brass plated groups and group heads and steel plated brass parts. #2. Grinder (fresh coffee) – unless you grin the beans instantly for each cup you are losing flavour. Aim for a machine that comes with a conical, burr grinder with a large range of grind settings. I like the Rocky by Rancilio. You are looking at around $200-400 for an average grinder. Do NOT buy a blade grinder as the blades heat up burning the coffee. #3. Manual (semi-automatic) – I would be looking for a machine that allows me to control the shot. When watching the coffee come out of the machine look for colour, speed, volume and many other factors. Machines that internalise the extraction process or control the shot are losing the quality in my mind. There are many machines in the market that meet this level of expectation. You may also like to look at a machine that has an e61 group handle. You may look into machines with a separate boiler for steam as per coffee. This can assist with better quality and consistency as the temperature required for steam and coffee are very different. Tip#1 dont believe forums as every manufacturer and model has the occasional angry customer. Tip #3 I do not recommend Pod systems as they do not offer quality in my opinion. If you are looking for ease of preparation buy an aeropress or similar filter option. Great post! I actually didn’t know that about the origin of espresso and that machines exploded in the early years. Must have caused quite a scene in the cafe (haha). Reading through coffee forums, I often see people mention “double boiler” espresso machines and how great they are… Do you think it’s worth the investment? A very knowledgeable post, thanks. 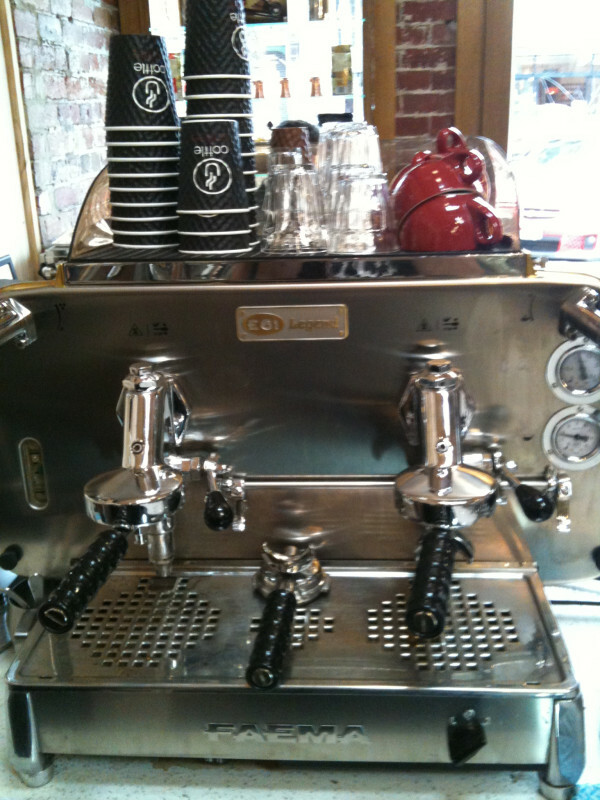 Do you like the idea of reconditioned commercial coffee machines as opposed to brand new?